The Seaside Amelia Inn is a 46-room boutique hotel located directly on the beach in Amelia Island, Florida. Features in include a free hot breakfast, a rooftop sundeck, and outdoor pool. Historic Downtown Fernandina Beach is 3 km away. Sail back in time with a voyage to Amelia Island at Fernandina Beach, a historic beachfront community that proudly embraces its rich heritage as a Victorian seaport village. 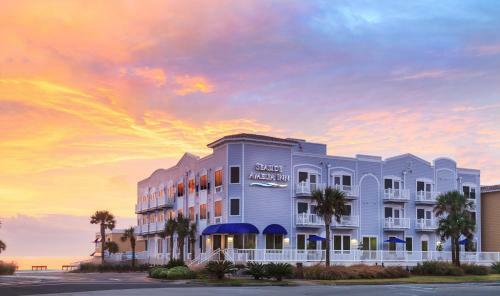 While here, make safe harbor only one block from the beach at the Hampton Inn Amelia Island at Fernandina Beach -- a hotel that offers the passion and service to make your voyage a memorable one. Guests of this Amelia Island, FL hotel will enjoy many amenities, including free On the House hot breakfast, free WI-FI, 32' HD flat panel television, outdoor pool, use our beach equipment for free and more.